up. They were doing a special: one dollar glasses of their best-selling brew: the Stumblin’ Monk. It’s a Belgian Abbey Tripel, and pictured below. It looks like just another lager, and it smells unexceptional. However, neither of those features are the main event with a beer, and it does excel in the two places most important to a good beer: flavor and, shall we say, relaxation power. By all accounts, it’s a rather unassuming beer. Once it hits your tongue, however, you’ll never want to put your glass down. The flavors one associates with a Belgian Tripel—a touch of yeast, the wheat and just a hint of hops—mingle nicely with fruity sweetness, and it’s all very subtle and balanced. I drank half my glass before remembering that the stuff is 9.2% alcohol by volume. I find it a touch tiresome when people refer to a delicious alcoholic beverage as “dangerous,” but that’s exactly what the Stumblin’ Monk is. It’s a light, refreshing beer that can and will put you hard on your behind if you let it. 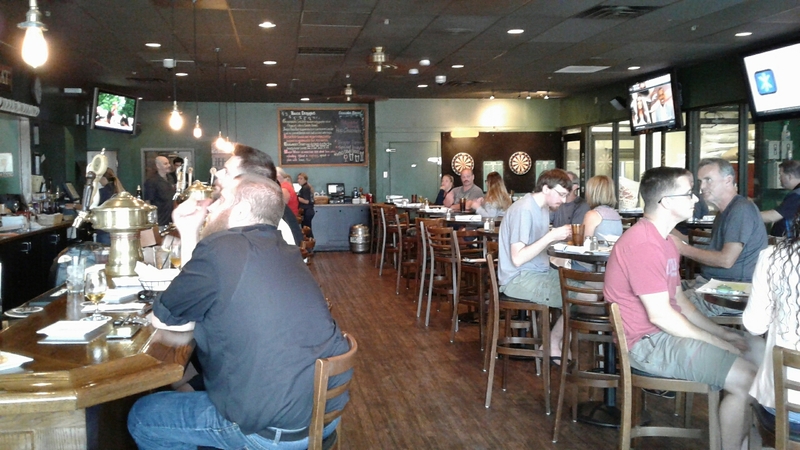 The Stewart’s Brew Pub places a limit of three on each guest. I could see why after two undersized glasses. The brew pub itself is designed quite brilliantly. The two-sided bar divides the dining room down the middle, with high tops on one side and a normal restaurant dining room on the other. According to the website, they’ve worked to keep the space a family-friendly environment, and that totally aligns with my experience with the place, though I was there around four in the afternoon on a Thursday. The high tops and actual bar area are well laid out too, and there’s a good amount of space. Tucked into one corner is a little group of leather (or maybe it was pleather; either way) arm chairs. Another corner sports a pair of dartboards. I really wish I lived closer; that way, I could actually spend a good amount of time there on a Friday night. It seems like the kind of place I would want to be. Part of that vibe is the service. The bar itself seats 30, so the bartenders are kept quite busy, particularly on a day of an event like yesterday. Even still, both of the employees that served me were friendly, cordial, well-informed, and possessed great attitudes. We only ordered a couple of happy hour appetizers (pretzels and beer mustard and crispy fried grouper), so I definitely need to go back and sample more of their menu items (and beers). Those appetizers were excellent, though. The grouper brought me back to fish sticks, but without the taste the freezer inevitably adds. The pretzels were served with a spicy whole grain mustard (apparently made with beer), and what’s better than warm, fluffy pretzels with cold beer? I cannot wait to go back to Stewart’s. I just hope I can choose what I want when I do. A dollar for a glass of craft beer? What a bargain. Sounds great.